The International Festival “Night Serenades” was founded in 1982 in Abkhazia with the initiative of a famous Georgian violinist and conductor - Liana Isakadze. Unfortunately, the festival was ceased in 1991 and only after 18 years, in 2009, it was renewed in Batumi. Since then, the creative director is Liana Isakadze. But this year, her nephew, Giorgi Issakadze will be the creative director as well. 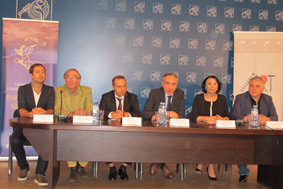 The festival Press Conference took place on Wednesday at the Ministry of Culture and Sport of Georgia. The event was attended by the Georgian Minister of Education Mikheil Batiashvili, Director General of Festival Nina Tsagareli, conductor Vakhtang Machavariani, violinist Gia Iashvili, General Sponsor of Festival -Telasi representative Valeri Pantsulaia and representatives of media. Batiashvili highlighted Liana Isakadze’s work and contribution and expressed hope for the festival to return to its original location - Abkhazia. "This is one of the most important cultural events in Georgia. The Ministry will continue supporting this festival," he noted. Nina Tsagareli presented the team and thanked supporters: Tbilisi City Hall, Ministry of Culture, Batumi City Hall, Check in Georgia, Telasi and media partners. She also mentioned that Liana Isakadze wants to establish a string competition on the base of the festival. "This year, Giorgi Issakadze is leading the festival along with Liana Isakadze. However, this is not the first year of his collaboration with Liana," she said. Giorgi Isakadze talked about this year’s concerts and discussed the program. "The program includes a romantic part as well. Violinist Geza H. Legocky will join us on August 28. We will present tango Evening on August 29. We are continuing our festival in Tbilisi where the concert will take place at Tbilisi State Conservatoire,” he said. Gia Iashvili mentioned Tango Evening on August 29 and famous musicians, including renowned guitarist Zsofia Boros (Italy). “The repertoire of 'Tango Evening' includes Astor Piazzolla’s work as well as other famous pieces. We are happy that Vakhtang Machavariani will conduct and support us throughout the festival," said Iashvili. Vakhtang Machavariani noted that he has collaborated with this festival before as well. "Anniversary Festival will feature numerous interesting pieces for everyone. It is an honor for me to form part of this year's festival," he said.